Decades before Michael Bay’s live-action movie franchise began, the Transformers dominated various forms of media. The toys and the TV series launched pretty much simultaneously in 1984, and matters jumped to the big screen in 1986 with the animated Transformers: The Movie. 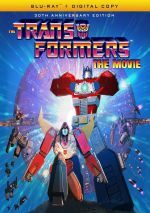 Over the millennia, the noble Autobots – led by Optimus Prime (voiced by Peter Cullen) – have battled the evil Decepticons and their boss Megatron (Frank Welker). Most of these fights revolved around control of their joint home planet Cybertron. In the midst of these eternal conflicts, a new danger emerges. An enormous, world-eating robot called Unicron (Orson Welles) heads toward Cybertron. Optimus and his comrades need to deal with the dual threats posed by the Decepticons and Unicron. Back in 1986, Transformers bombed at the box office. Maybe kids felt like they got enough of that action on TV and didn’t need to shell out for movie tickets. Whatever the case, the film earned less than $6 million, which didn’t even equal its modest budget. I was 17 when Transformers emerged in 1984, so I was officially “too old” for the franchise. I guess I’m still too old 30 years later, but I know The Movie maintains a strong fan following, so I felt curious to check it out and see if it boasts any merits beyond basic nostalgia. The answer? Nope – not at all. If you don’t enjoy warm ‘n’ fuzzy childhood memories of this atrocity, you’re highly unlikely to take away anything positive from it. Unless you just can’t get enough of campy cheese, that is. Nothing about Transformers makes much sense, as even with a fairly simple plot, it muddles matters to an extreme degree. This story shouldn’t be as confusing as it is, but the movie tells the tale in a borderline incoherent manner. Rather than develop the story, Transformers makes everything breathless. One melodramatic moment follows another, and none of them possess any impact. We couldn’t care less about any of the characters involved, so the story becomes a messy morass. It feels like 75 percent of the movie wants to be a climax. One big, nonsensical scene follows another, and these leave the viewer with no sense of excitement or thrills. The sequences just feel like action without purpose. This over the top orientation extends to the movie’s terrible music. From the cheesy synth score to the 80s action flick “inspirational” songs, the music here consistently stinks, though Boogie Nights fans will laugh when they hear the original version of “The Touch”. Although Transformers enjoyed a big-screen budget, it still suffers from Saturday morning animation. I suspect the visuals boasted a bit more detail than the TV-based Transformers, but the results remain crude and ugly. The movie consistently looks cheap. I hoped that the cast – with a variety of “name” actors involved – might redeem Transformers, but that doesn’t occur. They “act down” to the material and fail to bring any life to the proceedings. Does Transformers comes with any positives? None that I can discern. This movie exists to sell toys and it achieves no artistic or entertainment merit whatsoever. 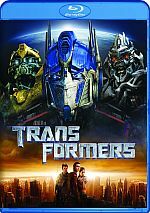 Transformers: The Movie appears in an aspect ratio of approximately 1.85:1 on this Blu-Ray Disc. Though touted as a 4K transfer, the image seemed mediocre. That’s because a 4K sow’s ear is still a sow’s ear, and there’s only so much that can be done with a 30-year-old cheaply made animated film like this. Sharpness generally looked good, though clear exceptions occurred, as the movie provided more than a few soft spots. I suspect these resulted mainly from dodgy art, but it could be hard to tell. No signs of jaggies or shimmering occurred, and I saw no edge haloes. Source flaws popped up on occasion, so I saw periodic examples of specks, marks and small streaks. These didn’t dominate, but they created modest distractions. Although Transformers went with a fairly broad palette, colors tended to seem average. Some hues came across as reasonably peppy, but most tended to appear more than a little flat. Blacks looked moderately rich, and shadows showed acceptable clarity. This was a decent image given its age and origins. I felt the same about the movie’s DTS-HD MA 5.1 soundtrack, though it impressed me more. The soundscape offered reasonable breadth, especially in the forward channels. Those created good stereo music and even localized speech on occasion. Effects managed to pop up in fairly logical spots and they blended to a decent degree. Surround usage added some involvement. Not a lot of unique information came from the back channels, but they managed to contribute extra dimensionality to the situations and worked fine overall. Audio quality was dated but decent. Music lacked a ton of range but the score and songs seemed fairly distinctive. Effects could be a bit rough at times, but they showed reasonable heft and lacked significant distortion. Though speech occasionally showed some edginess, the lines stayed intelligible. The audio seemed satisfactory. Disc One brings us the widescreen Transformers examined above, while Disc Two offers a fullframe version of Transformers. A comparison of the two leaves the impression of tighter framing in the 1.85:1 edition, but it doesn’t appear that the widescreen cut loses crucial information. While I suspect fans will opt for the 1.85:1 movie, it’s good to have the choice of aspect ratios. Both discs include the same extras, and we start with an audio commentary from director Nelson Shin, actor Susan Blu and story consultant Flint Dille. Recorded for the film’s 2006 20th anniversary, all three sit together for a running, screen-specific look at story/character areas, cast and performances, art and animation, music, changes from the TV series and the movie’s legacy. While not a terrible commentary, this never becomes a good chat, either. At its best, the track gives us a smattering of decent details about the movie’s production. However, much of the material remains fairly superficial, and the commentary loses a lot of steam in the film’s second half. Maybe big fans will get something from this track, but I think it lacks much merit. A “retrospective documentary”, ’Til All Are One runs 46 minutes, 32 seconds and features Dille, Blu, Shin, comic book artist Livio Ramondelli, singer/songwriter Stan Bush, composer Vince DiCola, and actors Dan Gilvezan, Neil Ross and Gregg Berger. “One” looks at the film’s origins and development, story/characters, cast and performances, visual design and animation, music, and the movie’s legacy. “One” offers a competent documentary. While it gives us a reasonable array of details, it doesn’t ever become terribly interesting. It delivers a decent meat and potatoes overview and that’s about all. For a look at the disc’s transfer, we go to the seven-minute, 16-second The Restoration. It provides info from negative assembly technician Ronald Juarez, scanning technician Lester Meek, principle color scientist Joseph Slomka, QC technician Brian Elkins, and restoration technician Daniel Mendoza. Some of the material becomes informative, but this is mostly self-congratulation. Rolling Out the New Cover lasts four minutes, 49 seconds and provides comments from Ramondelli. He discusses his work for the Blu-ray’s cover. Ramondelli offers a few useful thoughts. Three more featurettes appear next. The Death of Optimus Prime fills five minutes, two seconds with notes from Dille, Blu, Shin, and producers Tom Griffin and Joe Bacal. The piece looks at the decision to kill off Optimus and controversies that resulted. We get some of this in the commentary but “Death” offers a reasonable synopsis. During the 10-minute, two-second Cast and Characters, we encounter Dille, Blu, Shin, Griffin and Bacal. As expected, they give us notes on the actors and various film roles. Like “Death”, this turns into a moderately engaging piece. Finally, Q&A goes for 13 minutes, three seconds and features Dille, Shin, Blu, Griffin and Bacal. They discuss their favorite scenes/characters, music, cast and performances, and a few production details. The “Q&A” offers a handful of good notes but it tends to be somewhat superficial. Under Animated Storyboards, we can inspect three scenes. These cover “Fishing Scene” (2:09), “Battle” (4:31) and “’One Shall Stand, One Shall Fall’ with Deleted Sequences” (5:27). As promised, these take the original storyboards and film them to create storyreels. They’re moderately interesting, though “Stand” works best since it uses deleted material. A few ads finish the set. We locate two trailers and eight TV spots. Someone out there probably likes Transformers: The Movie for non-nostalgic reasons, but I can’t comprehend that attitude. Cheap, silly and totally without entertainment value, this becomes an unwatchable dud. The Blu-ray offers erratic visuals along with reasonably good audio and a decent collection of bonus materials. Unless you want to bathe yourself in childhood memories, stay away from the awful Transformers.